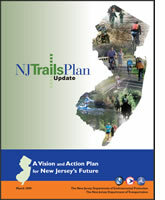 The 2009 New Jersey Trails Plan Update presents a renewed vision, goals and strategic actions to help guide the efforts of all those who plan, build, operate and maintain New Jersey’s trails. This Plan builds on earlier statewide plans and assesses a broad range of needs, desires, topics and issues from the standpoint of both trail users and trail providers. The Trails Plan Update has been shaped by input from a broad range of New Jersey's trails community, which includes those who use trails for outdoor recreation, for enjoyment of outdoor settings and for traveling to community destinations. The planning process engaged this community and the general public through surveys, focus groups, open houses and workshops. The development of the Trails Plan Update was a cooperative effort among the New Jersey Trails Council, the Trails Plan Advisory Committee and staff of the New Jersey Department of Environmental Protection and New Jersey Department of Transportation. The Trails Plan Update serves as a blueprint for future actions to improve New Jersey’s trails for recreation, transportation and quality of life. Note that the Trails Plan Update does not include maps or trail locations, as it is not an inventory of existing trails or a proposed network of trails. Rather, it describes issues and opportunities for those involved in planning, developing and maintaining trails in New Jersey. The plan is posted here in two forms plus an Executive Summary. Presents the general types of trail uses that the Plan addresses. Provides an overview of the key agencies, programs and plans that guide trail development today, along with some historical background. Describes societal trends and conditions that are changing the context for trails and how we use them. Summarizes the results of extensive outreach during the development of the update and outline the challenges to planning, establishing and maintaining New Jersey's trails network. Describes the conditions of an ideal future in which key issues are addressed and overcome. Chapter 5 presents goals and recommends actions that can be taken by organizations and people throughout New Jersey who value trails and who are committed to expanding and improving trails for all. These recommendations were garnered from the many people who participated in preparing the Update. Identifies organizations, public, private and non-profit, who have lead or supporting roles in implementing the Plan. The first Trails Plan for New Jersey was developed in 1996. View a PDF of the full plan here.